Looks like the Bay Bridge is back open in San Francisco, but my what drama. 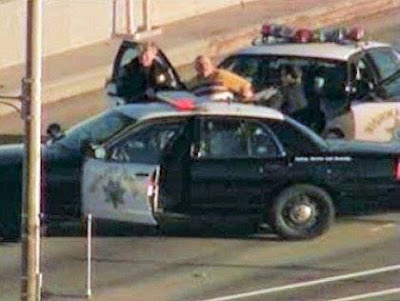 A "mentally unstable" man stopped his sport utility vehicle on the upper deck of the Bay Bridge this morning and threatened to jump off the span or detonate explosives, forcing officials to close the westbound direction for two hours, the California Highway Patrol said. The man, who had his 16-year-old daughter in the SUV, was taken into custody without incident at 8 a.m., about an hour after he got out of the car and began calling police and at least one radio station. The girl was unharmed, CHP Sgt. Trent Cross said. The upper deck reopened to traffic at about 9 a.m., after authorities drove the SUV off the bridge to San Francisco. No explosives were found in the car or on the bridge, Cross said. "He feels really bad for what he did," Cross said. Authorities did not release the name of the man, an Antioch resident in his 50s. He has worked as an emergency medical technician and drove an SUV that was outfitted with flashing lights and a light bar in the rear, officials said. The man had a gun, but threw it over the rail of the bridge into the bay as officers watched, Cross said. The man said it was a pellet gun, the sergeant said. I’m still looking for the name of the assailant. Video of the assailant below. Great coverage from CBS, here. Update x3: Contra Costa Times has the assailant from Antioch and also reports that he had a gun and a pipe bomb. Probably will get a seat on the board of city supervisors now.